Dark spots are something that I have developed a lot of recently and they do bother me quite a bit so when I was offered the chance to test this out I was really excited as I am always trying to find products to fade them. Thank goodness I found Multi Brightening Serum. I really like the design of the bottle, you simply twist the top to reveal the pump and then twist back to hide it again. This means that you can’t press the pump accidentally and waste the product, it also makes the bottle look very sleek. The actual serum itself is runny and feels incredibly silky and lightweight on the skin. It absorbs into the skin really quickly, it literally takes two minutes to sink in. It does have a slight scent, I’m not quite sure how to describe it, but it’s unpleasant at all. I have been using this for two and a half weeks now and I can honestly say I am really impressed with it. The dark spots I have are significantly faded and reduced in size, I used to have to layer foundation and concealer and keep reapplying throughout the day to keep them hidden, but now the tiniest amount of foundation makes them invisible and even without it they are not very noticeable. I have quite dry and sensitive skin at the moment but using the Multi Brightening Serum twice a day has also really helped to calm this down, it cleared up some eczema patches on my face within two days! Since beginning to use this, my skin looks a lot brighter and my skin tone appears far more even. I have even gone out minus foundation a few times, which is something I would never normally feel comfortable doing. I am really surprised with how quickly this has worked to reduce and fade the dark spots. If they carry on fading at this rate in another few weeks they will be gone, which is amazing as some of them have been there about a year! 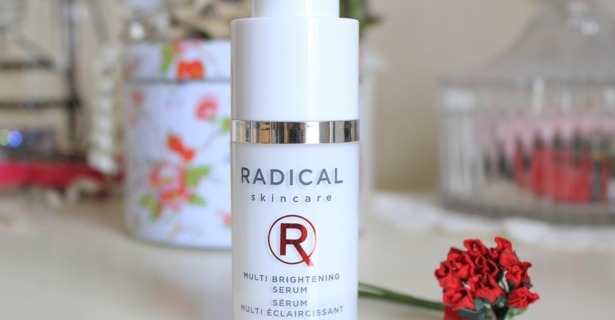 The Multi Brightening Serum costs £95, which yes is rather expensive but if you are looking for a product that really effectively deals with dark spots and uneven skin tone I would really suggest you try this, it has definitely made me feel a lot more confident about my skin.